As a recent first time homebuyer, I’ve been doing a lot of research on everything there is to know about owning a home. I have spent countless hours searching for home improvement projects. How to take care of your lawn. How to protect your home. But never have I thought that both of those things could go hand in hand. I’m never let down by the internet. I wasn’t too surprised when I came across this scholarly journal article on the U.S. Department of Agriculture website. While it is an incredibly obscure topic, the authors bring up great points. And they back up those points with statistical analysis. The authors of The relationship between residential yard management and neighborhood crime: An analysis from Baltimore City and County, took a look at 1,000 front yards and 40 different indicators - shrubs, lawn, trees, landscape features, etc. 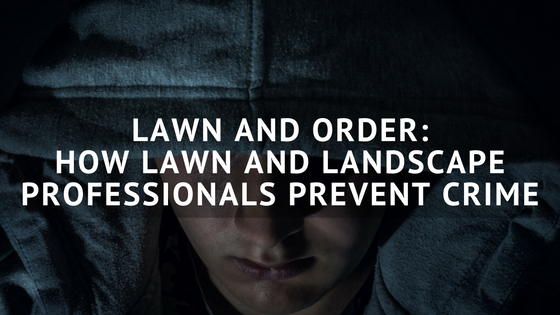 Their overall hypothesis is that maintaining your lawn and landscape reduces crime. Bold claim you say? Let’s take a look at why that is the case. One correlation which statisticians have found is that properties with broken windows tend to be the location of more crimes. One reason that this might be is that perpetrators believe that isn’t cared for, there is less of a chance they will get caught for a crime. The opposite is true for well-taken-care of yards and homes. This effect is what the authors call “cues to care”. When a would be criminal sees these cues to care, they read them as a signifier that the resident(s) are active and present in their community. Another hypothesis as to why crime and well maintained lawns and homes are negatively correlated is that residents have a greater number of “eyes” on their property. Since they are concerned about the look and overall upkeep, they have more people to watch their property. If more people are likely to take a look at how nice your yard looks or how well maintained your flowerbeds are, would-be-criminals are less likely to find opportunities to vandalize or burglarize your property. The authors also hypothesize that property owners that take care of their lawn and landscape tend to spend more time outdoors and have a greater social network within the neighborhood. Because they have a network of people they know, their network is more willing to act if they see any criminal activity. The final hypothesis that the authors make is that “green surroundings have been found to be associated with lower levels of aggression and mental fatigue”. Having a well maintained and landscaped yard surrounding your house can cause a psychological effect which could deter crime. It can invoke a calming effect, not only for the owners, but also strangers. Want to know how to create a lawn maintenance website that can attract more customers? Download the free eBook, Local SEO for Green Industry Businesses. Just click below!